If you are looking for a magical experience when you head to Disney World, the Bibbidi Bobbidi Boutique is a great place to get some extra magic for your Walt Disney World trip. The Bibbidi Bobbidi Boutique is a great place to spend some of that “splurge money” that you have been saving up. My daughter loved this magical Disney experience when we went to Disney World. It really is the perfect experience for any little girl who loves being a princess. From start to finish, the Bibbidi Bobbidi Boutique keeps the magic going. Once your child arrives at Bibbidi Bobbidi Boutique they will meet their Fairy God Mother. Her Fairy God Mother will show her where the dressing room is, so she can get changed into her beautiful princess gown. There is an age limit on the Bippity Boppity Boutique experience, so if this is on your bucket list you want to be sure you go when your child is of age. To participate, Guests must be between 3 and 12 years of age and be accompanied by an adult (18 years of age or older). You have the option of buying one there or bringing your own. Costume choices in Bibbidi Bobbidi Boutique may include Anna, Elsa, Ariel, Snow White, Aurora, Belle, Jasmine, Cinderella, Tinker Bell, Tiana, Rapunzel, and Merida. But if you are looking for a great savings tip, bring your own princess dress. I was able to get my daughter her Belle dress right after Christmas on sale at the Disney store, that saved a lot of money! After they are dressed they get to sit in a royal salon chair and receive their makeover fit for a princess. The Bippity Boppity Boutique makeover will take 30 minutes to one hour, depending on the package selected. After your daughter’s magical makeover at Bippity Boppity Boutique, you can go next door to the photo studio for their special princess photoshoot. If you have memory maker, they have Disney Photo staff there who will take photos of the whole thing and you will see them in your Disney Memory Maker account. Now your little girl can spend the whole day, walking around perfectly dressed as a Princess. If you have a son, like I do, who is wanting to be their sister’s knight and shining armor they have mini makeovers for the little prince in your family as well. They are super fun for the kids too! Everything you need to know about Bibbidi Bobbidi Boutique! Where is Bibbidi Bobbidi Boutique? 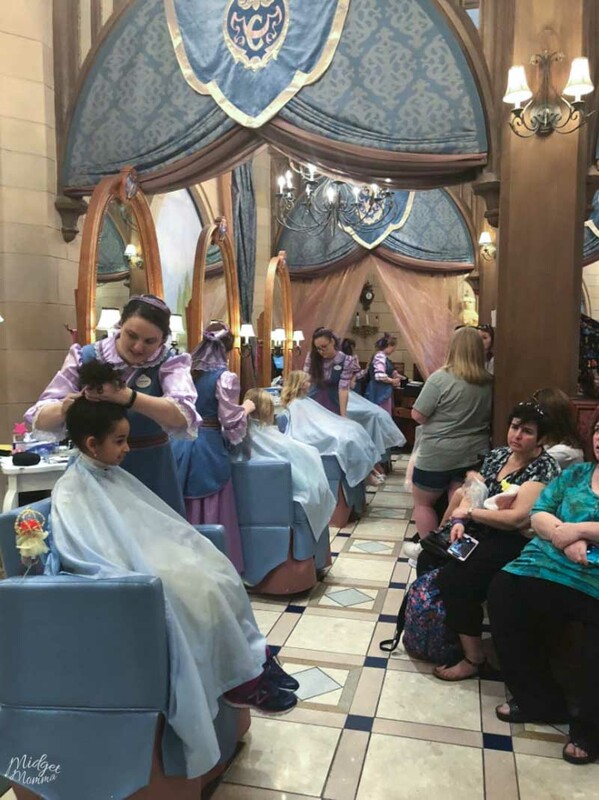 There are two locations at Disney World where your girl can get the royal princess treatment. The Bibbidi Bobbidi Boutique Disney World shop that is located in Cinderella’s castle at the Magic Kingdom. This one is great if you plan on spending your day in Magic Kingdom. You can also head on over to the Bibbidi Bobbidi Boutique Disney Springs location in Once Upon a Toy store. At both Bibbidi Bobbidi Boutique locations you will get the same special Disney princess treatment. There are three hairstyles to pick from when you are are making a trip to Bibbidi Bobbidi Boutique. 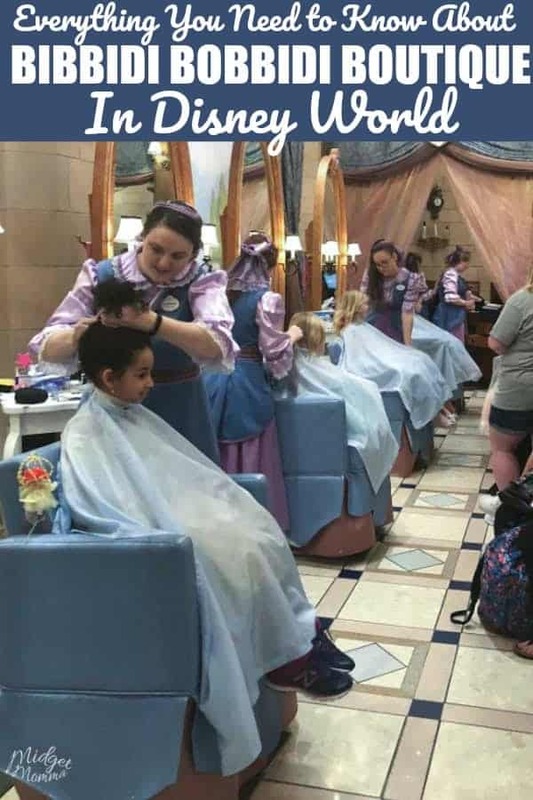 In order to get a spot for the princess makeover you do have to make Bibbidi Bobbidi Boutique reservations. Reservations can be made up to 180 days in advance and are highly recommended. To book your appointment with a Fairy Godmother-in-Training, please call (407) WDW-STYLE or (407) 939-7895. These are the package prices for the Bibbidi Bobbidi Boutique princess packages. There are some additional extras that you can add on to your fun at Bibbidi Bobbidi Boutique. Be sure to check out these other great Disney Posts to help you with your Disney Vacation Planning. 6 Tips For Doing Disney In The Rain.